There's been a lot of discussion among my colleagues at CORE Education recently about the nature of transformation, and what this looks like in education. Stories emerge daily in our media of how our existing education system is failing to adequately address the needs of current students such as this one about Auckland's education story or this one about our 'broken' assessment system. So where are the stories of where innovation is challenging traditional educational systems and models in a practical sense? We do have some great examples of innovative practice here in NZ, as highlighted by the Prime Minister's excellence awards, or browsing the case studies on the NZC Online site or the enabling eLearning site for example. There's so much we can learn about innovation and the transformation process from such stories. With this in mind I was encourged recently to find this site from InnoveEdu featuring 96 initiatives from around the world. Each story presents meaningful learning experiences connected with the demands of the 21st century, distributed among five categories. Curated by Porvir, in partnership with Edsurge, Innovation Unit and World Innovation Summit for Education, InnoveEdu presents a wide range of ideas. Entries range from technological tools to facilitate teachers' jobs, to government policies to transform pedagogical practice in public education systems. 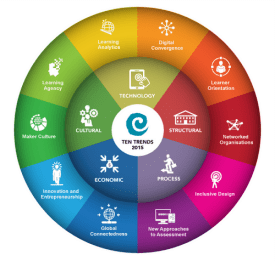 Trend – focusing specifically on one or more of five trends identified by the project as being hallmarks of innovative education experiences; 21st century skills, personalised learning, hands-on learning, community based learning and new credentials (including new forms of assessment). Using this framework, each case study is presented in a way that allows you to easily access the key points and make comparisons between and across a range of contexts. What do you get when you achieve a state where everyone 'buys in' to the change that is happening and feels that they are a part of it? You get systemness – a state where there is a 'harmonisation' among all parts of the system, each working towards the same vision and doing their part to 'make it work'. In our current education system, particularly since the 1989 reforms in NZ, we have seen a pervasive spirit of competition and divisiveness among schools in our system, brought about largely because of the emphasis on the 'self managing school', and rewards for leaders who are successful in making their particular school successful (often at the expense of or in spite of what's happening elsewhere). While this may be a good thing in terms of the experience of students in that partcular school, the result is fragmentation at a system level, with significant variations among schools and learners, depending on where they are learning and who they are learning with. This thinking has been reinforced for me as I've worked recently with Michael Fullan with the NZ cluster of schools participating in the New Pedagogies project. Systemness is one of the things identified in Michael's 2011 paper titled Choosing the Wrong Drivers for Whole System Reform, in which he identifies four policy and strategy levers that have the least and and four with the best chance of driving successful reform. A ‘wrong driver’ is a deliberate policy force that has little chance of achieving the desired result, while a ‘right driver’ is one that ends up achieving better measurable results for students. Systemness is not simply about aligning our activities and focus at a system level, it is about system coherence – it involves a mindset change. ​"Systemness” means that you develop experiences in people where they start to identify with the bigger part of the system itself. So a teacher, for example, who moves from just thinking of “my classroom only” to thinking of all the kids in the school—that’s “systemness”. It becomes a case of thinking in terms of "we, not me". At the system level, ‘systemness’ means all schools work to improve the learning of each and every student across the system. Within the local school context, ‘systemness’ means each teacher isn’t just responsible for the learning of his/her own students, but for each and every student in the school. Structures won't achieve this – it requires a change of thinking and mindset. For too long we've tolerated a high degree of fragmentation in our school system, celebrating the achievements of individual schools at the expense of their neighbouring ones, and we've promoted the teacher and principal 'heros' at the expense of their colleagues. We have to change this mindset and work more determinedly towards a state of 'systemness' – a refreshed way of thinking that places the wellbeing and needs of every learner in the system at the heart of our thinking and decision making. I've just been browsing this recently released report from the Economist Intelligence Unit titled The skills agenda: Preparing students for the future which draws attention to the challenge in education to prepare our current students with the skills and knowledge they'll require to participate fully in the future, in particular, in a digitally-enabled future. The EIU embarked on a research programme, sponsored by Google, to examine to what extent the skills taught in education systems around the world are changing. For example, are so-called 21st-century skills, such as leadership, digital literacy, problem solving and communication, complementing traditional skills such as reading, writing and arithmetic? And do they meet the needs of employers and society more widely? 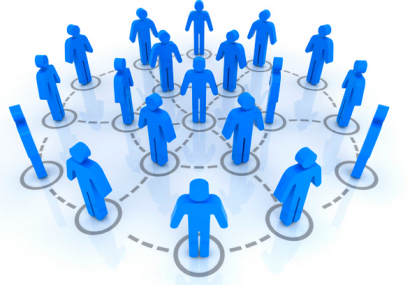 Problem solving, team working and communication are the skills that are currently most in demand in the workplace. Education systems are not providing enough of the skills that students and the workplace need. Some students are taking it into their own hands to make up for deficiencies within the education system. These findings are consistent with the work of many other reports I read in the course of my work, and very consistent with the work of a group I am part of here in Christchurch where I live comprising members of local IT-related companies, the local economic development agency and some educators. Key issues that this group are considering include the fact that while there is a bias toward increasing demand for employees to fill positions in the IT sector, there is a distinct lack of sufficiently skilled staff available to fill these roles, which in turn is becoming a barrier to companies being able to grow and achieve their organisational goals. The same concerns exist in other parts of NZ – in Auckland earlier this year a survey of 61,000 secondary school students found that less than 6 per cent had a qualification in basic ICT, raising concerns among the Auckland Business Leaders Group about the ability to find staff for the growing number of IT-relaed jobs appearing in the city. The EIU report does contain several examples of where, at a strategic and systemic level, initiatives are under way that are addressing these issues, with students proved with opportunities at all levels of the school system to develop the range of digital literacies required to prepare them for their future. One example comes from New Zealand – featuring the work of the Manaiakalani Education Trust in Auckland (see page 11 in the report) where the provision of devices for each student has resulted in significant gains in learning for students, and preparation for their digital futures. This style of learning places new demands on teachers, who may themselves not be universally equipped with the competencies to lead a more fluid, interactive class. It also requires governments to be willing to rethink their approach to teacher training and professional development. It is no longer sufficient—if it ever was—that teachers are well versed in their subject. They must recognise that the skills a student acquires through learning are as important, if not more so, than the content, and be able to incorporate opportunities for the development of problem solving, collaborative, creative and communication skills into their teaching. These skills cannot be taught in isolation but must be present across the curriculum, embedded in the fabric of how teachers teach. We have this happening in pockets aroun the country – but how can we link it up and ensure that every student in every school has these sorts of learning opportunities as a matter of course? This is what the transformation agenda is about!!! I currently have the privilege of participating in and contributing to a variety of working groups and reference groups that are concerned with the future of education, each addressing various aspects the traditional education system, including the future of assessment, the development of modern learning environments, the impact of technology etc. A central premise of much of this work focuses on just how well education is managing to keep up with the pace and scale of the rapid change that is experienced in the world in general, and how effectively we are equipping young people for life in a constantly evolving work environment. This is the question explored by Maha Barada in the latest edition of Learning World who presents three stories exploring this theme from different angles and in different locations. The LINQ Precinct at Sheldon College in Brisbane, Australia, an innovative, interdisciplinary education centre designed to equip students with skills they can hopefully adapt to any new technological advances. A pioneering project from a public high school in Rio, Brazil, where students are encouraged to take more responsibility and manage their own affairs, and is producing amazing results. The work of Graham Brown-Martin, founder of Learning Without Frontiers, a global think tank that brought together renowned educators, technologists and creatives to share provocative and challenging ideas about the future of learning. Throughout the video the same themes and challenges in our traditional education system are addressed – particularly the issue of assessment, and how the continuation of traditional approaches is fast becoming a 'handbrake' on the appropriation and development of the sorts of approaches to learning we should be taking in our schools and classrooms. As schools and teachers embrace modern learning practices there inevitably emerge a range of different beliefs about what works and why. Some of this becomes a part of the popular culture of education, and some of it even makes its way into policy at a national level. Headmaster Tim O'Connor said because Grammar's teaching style was to teach content, rather than focussing on student-led learning, the 12-classroom block's layout fitted it better. "Our teaching style is teacher-centered learning," headmaster Mr O'Connor said. "The key thing with the new classrooms are that they are wide not deep – so those in the back row are closer and it's all about the relationship between student and teacher." In the rush to embrace modern learning practice there is inevitably a storng focus on the practices that may change – the practical, observable things that will impact on how things happen in schools. For example, the emergence of large, free-flowing spaces, moving from indiviudal desks to group tables etc. But these things alone will not change the effectiveness of our educational provision unless they are matched to our shared beliefs and values. It is there that we need to start – and continue to reflect and refine as we seek to develop an educaitonal approach that is relevant to the lives of our modern learners and their future. What shapes and forms our beliefs is important. Our own school experience, our particular world view, political or religious perspectives and the influence of particular thought leaders are all key influences on our thinking when it comes to forming our values and beliefs about education. A key challenge is to ensure that we are critically engaged, and constantly reflecting on these things in order to distinguish between the ideas that have substance and those that have evolved as 'myths'. An Edutopia article titled "8 myths that undermine educational effectiveness" exposes some of the ideas that are currently influencing or informing our practice. The 'myths' presented here provide a challenge to some of the things that we may be adopting in our own mindsets – or feel that we're obliged to work within. The key point here is the reminder that we need to remain vigilant as educational professionals and be continually assessing and being critically engaged with the new ideas and thinking as they emerge. The International Summit on the Teaching Profession is under way this year in Banff, Canada, with a contingent of NZ educators attending. Last year I had the privilege of attending this event when it was held here in NZ, and it provided a a great opportunity to hear from a variety of international 'experts' and leaders from a range of countries in the OECD. Among them was Andraes Schleicher who is the OECD's director of the Directorate of Education and Skills, and the person most will associate with the research behind the PISA results. He is also author of a new report titled Schools for 21st Century Learners which has been prepared for this year's Summit. Each of these themes is already a strategic focus in our NZ education system, and no doubt we'll see some of what happens at the Summit feeding back into our context. Of the three, however, I have spent a little time looking at the third one, Innovating to create 21st Century Learning Environments (p.61 in the downloadable PDF). Are highly attuned to learners’ motivations and the importance of emotions. Are acutely sensitive to individual differences, including in prior knowledge. Are demanding of each learner, but do not overload students with work. Use assessments consistent with their aims, emphasising formative feedback. Promote horizontal connectedness across activities and subjects, in and outside of school. The chapter describes how some schools are regrouping teachers, regrouping learners, rescheduling learning, and changing pedagogical approaches – and the mix of those approaches – to provide better teaching for better learning. These are all themes that CORE is currently addressing in our work on Modern Learning. The commentary and examples provided, together with the conclusions that the reearch team draw from, this will provide a useful reference for school leaders pursuing modern learning approaches in their schools, and who may find themselves responding to requests for 'the evidence' that this will contribute to better learning outcomes.